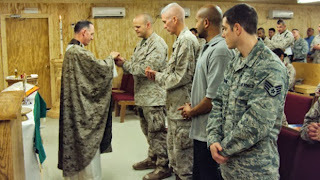 According to news reports, Eric Holder does not think that priests contribute to the morale and well being of those in armed service. One of the consequences of the government shut down has been the furlough of chaplains of all faiths. Catholic priests make up about 8% of the chaplaincy and their services have been offered to the military since the military existed. Priests have been told not to offer religious rites to soldiers, nor enter their offices. If they do, they will be arrested. Ironically, mental health workers have been allowed to offer their services. This is disturbing indeed. Many priests and ministers of other faiths have filed suit against the Obama administration for violation the first amendment. The fact that our government is harassing clergy is scary. The persecution is taking public hold in America. I hope priests keep strong and offer the Church's Sacraments even with the threat of arrest. This will send a strong message to Americans that the government is going too far in shredding the Constitution.